A startup called WiTricity thinks a form of wireless charging called magnetic resonance is a smarter way to power up. The technology takes energy from the electric grid, via a wire, and feeds it into a copper coil on the ground, creating a magnetic field. When a second copper coil attached to the bottom of the car comes within range of this field, an electric current is generated on the vehicle side, which is used to charge the car’s battery pack. 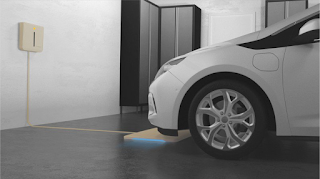 (For more details, see “Wireless Power.”)To charge, an electric vehicle (EV) simply needs to park over a coil and wait a few hours. WiTricity says this method is as efficient as inserting a charging cable directly into a car.